0.5m white satellite extension lead, male to female, ideal for extending the lead from a satellite dish to a Sky, Sky HD, Sky Q, Freesat or receiver or the input cable to Virgin Media HD. Screw on type F connectors. F-plug to f-plug lead with female coupler. Our white Virgin / satellite extension cables are a great way to extend your existing cable to move your set top box to a different location. Simply screw the coupler onto your existing cable then screw the extension lead onto the coupler, a cost effective simple way to move your Sky or Virgin box. Suitable for use with any equipment that has screw on F connectors, if using a dual cable system such as Sky HD or Sky Q just purchase 2 extensions. 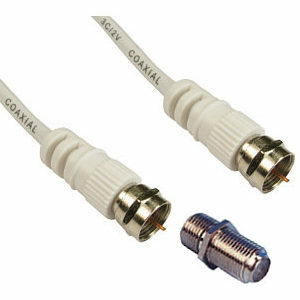 1m TV Aerial Cable Male to Male with female adapter coupler. Gold plated connectors. Supplied with female to female aerial gender changer. 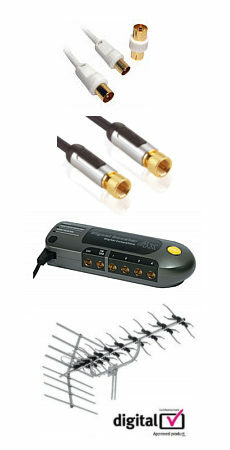 Perfect for analogue and digital TV Freeview connections including HD. RG6 Satellite Cable 100m Roll / Reel High quality RG6 satellite grade coaxial cable. Double screened, braid and foil screen. Supplied on 100m roll. Ideal for LNB connections on Sky, Sky Digital, Sky+, Sky HD, Freesat and other satellite receivers and cable TV systems. Colour white, also available in black.